Every Sunday: Soup Kitchen at “Our Place” – Victoria, B.C. 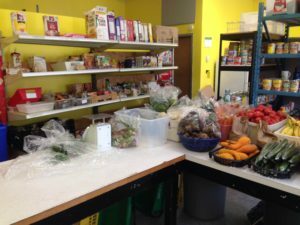 4th Saturday of every month: Quest Food Exchange – Vancouver, B.C. 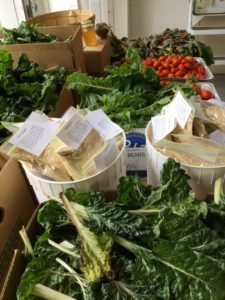 Quest Food Exchange program – Vancouver: Quest is British Columbia’s largest food exchange program. 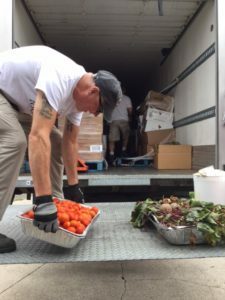 Their innovative approach to rescuing food and reducing hunger involves collecting and distributing quality food – overstock, mislabelled, or near-expired products that would otherwise go to waste – and redirecting it to those in need via four food-assistance programs. Our volunteers in Vancouver participate in the activities of Quest food exchange program in the fourth saturday of every month. 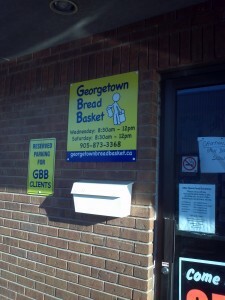 Soup Kitchen – Georgetown: The monthly soup kitchen held at Georgetown Bread Basket is proceeding well. Vegetarian chilli and fresh bread and pastries are served to about seventy clients of the Bread Basket. It is a matter of great satisfaction to hear that the hot lunch is well appreciated. 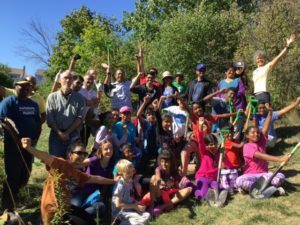 Farming – Georgetown: The farm activities have started in right earnest and there is a lot of weeding and harvesting to be done in the vegetable garden. 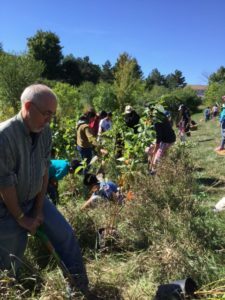 There is also work to be done in the fruit orchard. If you would like to participate please advise sri1960@gmail.com indicating your availability. Amrita Yoga was born from the divine resolve and unconditional compassion of renowned spiritual leader and humanitarian, Satguru Sri Mata Amritanandamayi Devi (Amma). 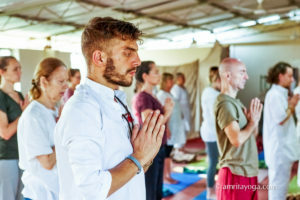 Focusing on Awareness with Heart-centered intention, Amrita Yoga transcends the physical asana practice to deepen self awareness so we experience the interconnectedness of all life. 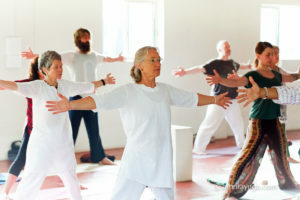 The practice creates inner and outer balance and harmony so our true potential is realized. 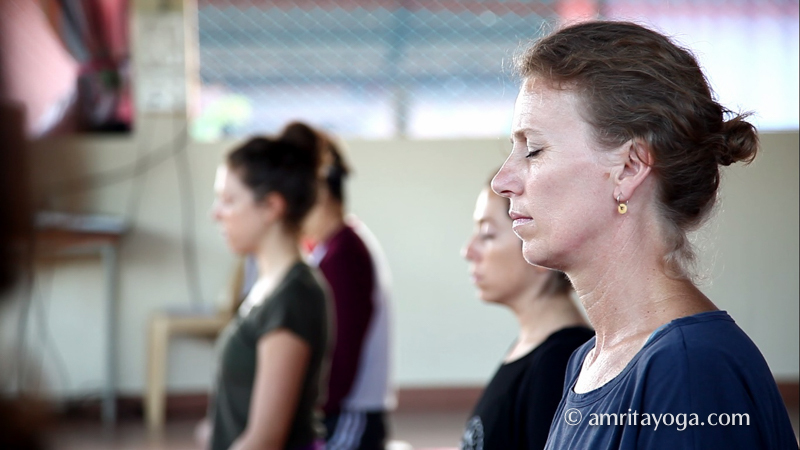 Amma’s vision for Amrita Yoga is a holistic breadth of yoga courses, taught in the spirit of love and service providing a practical way for people worldwide to lead Heart-centered lives and to discover their true nature. To provide a comprehensive yoga program that is rooted in the ancient and practical universal principles taught by Satguru Sri Mata Amritanandamayi Devi (Amma). 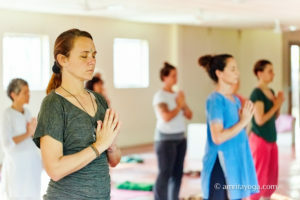 Amrita Yoga students cultivate a holistic attitude (mano bhavana), embrace practical Vedanta, gain physical strength, mental equanimity, and enhanced awareness of their hidden abilities. Brahmacharini Shobana, PHD Candidate in Yoga, is an award-winning yoga practitioner and teacher. She has dedicated her life to the pursuit of authentic yoga as a monastic in Amma’s ashram. 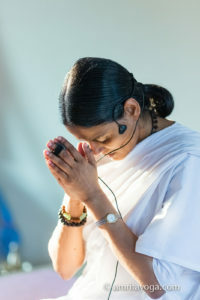 Under Amma’s direct guidance, as director of AMRITA YOGA® since 2004 she has taught more than 2,000 workshops, classes and retreats worldwide. Specializing in bridging the gap between the ancient traditional Eastern practice and the practical needs of yoga in the West, Brni Shobana travels regularly back and forth between India and the west. She is one of only 12 members (and the only woman) on the Indian government’s Committee for Yoga Education, which forms curriculum courses in Indian Universities. 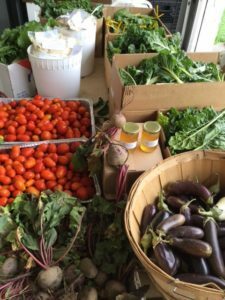 Feeding Halton is a collaboration of social service agencies and the agricultural community intent on ensuring equitable access to local fruits and vegetables for all. 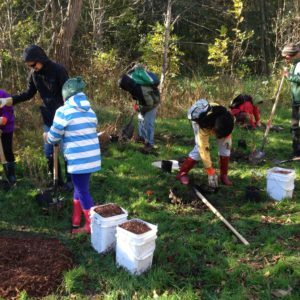 The collaboration consists of: Food for Life, Halton Fruit Tree Project, Halton Food for Thought, Halton Fresh Food Box, Open Doors at St. Christopher’s, Farmer Representation and the Halton Region Federation of Agriculture. 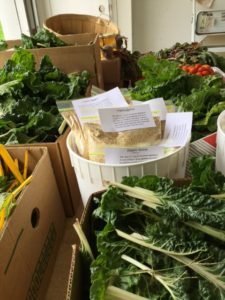 Feeding Halton works with the local growers to identify opportunities for purchase by or donation to hunger relief organizations. Donations made from the community are picked up by Food for Life and distributed to the Halton Hills/ Milton community right after pickup. 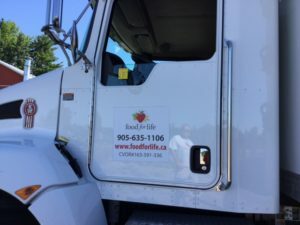 These donations help Food for Life to provide around 190,000 meals each month to children, seniors, families and other individuals in the Halton community. Acton Food Share. 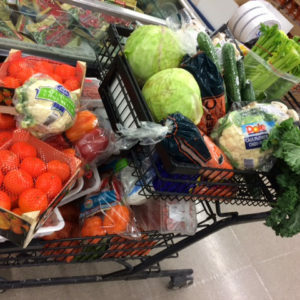 Is a weekly food bank, located in a small storefront, which serves the needs of the Acton Community, They serve over 130 families per month. Grace United Church, where a community dinner is held on the first Thursday of the month, reaching out to 70-80 families and seniors in the Milton community. Apples will be used for apple pies at the dinner and distributed to participants. 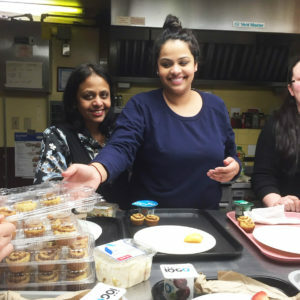 From February to May 2016, volunteers from Amma Canada participated in a series of eight vegetarian cooking classes as part of an initiative by Summit Housing and Acton Community Kitchen. Summit Housing is a non-profit organization which provides supportive housing, case management and advocacy to those with diagnosed mental illness and at risk in the community. The cooking classes were intended to help teach a small group of lower income families to prepare simple and healthy meals on a low-cost budget. The volunteers conducted cooking demonstration classes and at the end of the session, the participants, including the volunteers, sat down to enjoy the meal. The extra food was taken home by the participating families. In all, over 240 meals were shared among the participants. The cost of the items for the meals was covered by Amma Canada. 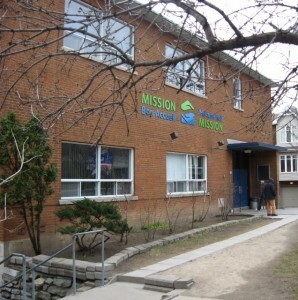 Welcome Hall Mission [WHM] is a well known and respected charity in Montreal, Québec where it was established around 120 years ago to help men with alcohol addictions. 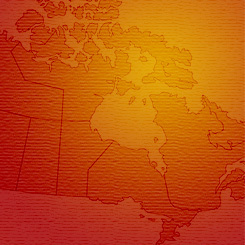 It is a registered Canadian charity (CRA registration number 10819 5215 RR0001). 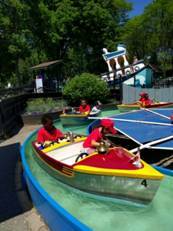 They have come a long way in terms of number and scope of charitable activities. 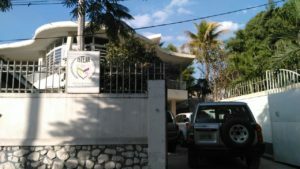 In 2010 WHM developed a program called “Cœur à sœur” as they witnessed a great need to help the homeless young women.The young women, ranging in age from 15 to 30, were often pregnant, in need of education around many aspects of pregnancy and life there-after, including the preparation of healthy food, basic health services, planning for the baby’s birth and preparation to become good and capable mothers. This education included the financial aspect to ensure they could care for their child so Government agencies wouldn’t have any reason to take their children away. 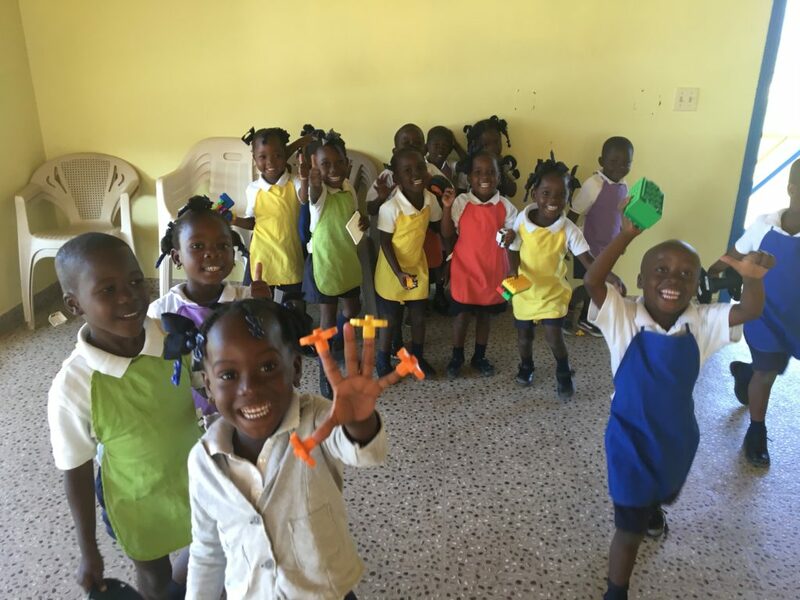 For the children, the charity provides basic needs and services, education and educational materials, guidance, follow-up supervision as they integrate into society, etc. In September 2016 WHM had 209 young women with children and 166 women without children under their umbrella of Hope. Their plan for the coming four years calls for 250 to 300 women to be added to those figures above, i.e. they anticipate having over 1,000 files by that time. It is a heart-warming sight to see how many babies now are born in a secure shelter with qualified assistance. Many if not most of the babies are seen every few months to ensure their growth and safety, as are their mothers. Many are followed for several years after their birth. The spiritual guidelines of WHM are that no one religion be given preference, that all are welcome under the umbrella of LOVE. 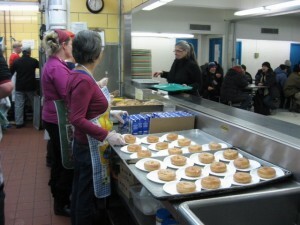 Since 2007, Volunteers from the Montreal group (of Amma Canada) have been preparing and serving a Saturday lunch once a month in the soup kitchen at WHM, known by the French name Mission Bon Accueil. Between 150 and 200 servings are made each time. WHM is efficiently managed with money spent only on necessities. Their overhead is 7% of total budget. A good number of their workers come from their own programs. In September 2016, Amma Canada entered into an agreement with WHM to support the “Cœur à sœur” program by donating the sum of $40,000 each year in four quarterly installments of $10,000 – the agreement was renewed for another year in September 2017 and again in September 2018. 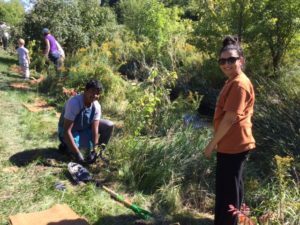 As in the previous twelve years, volunteers from Amma Canada participated in various tree and shrub planting events in the Brampton, Georgetown and the Greater Toronto area from April to October. 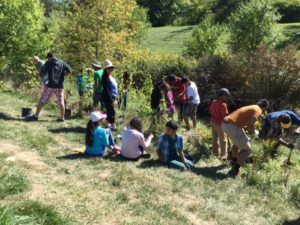 These projects, organized by environmental groups such as Credit Valley Conservation, Friends of Cedarvale, Eglinton Flats, Black Creek Farm, Taylor Creek Park, Newcastle Park, etc. 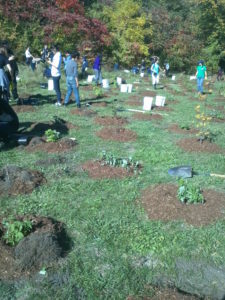 were well attended by our volunteers. 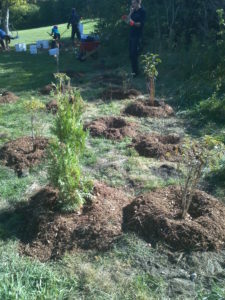 Amma Canada is very grateful to the Brampton City Parks for giving us an opportunity to assist with tree planting of seventy-five saplings in Newcastle Park in September. Amma Canada adopted Newcastle park in 2004. Since 2013, St. Felix Centre has operated the Extreme Cold Weather Alert (ECWA) program between November 15 and April 15, offering shelter, meals, washrooms, showers, laundry facilities, and individual support services to people living on the streets of downtown Toronto. . Between December 15 and March 15, when the weather is coldest, St. Felix Centre remains continuously open, providing services 24h a day, seven days a week. During this period, St. Felix Centre is stretched to capacity: though they only have spaces for 50 overnight guests, their numbers often exceeded 60, and still more people were turned away. 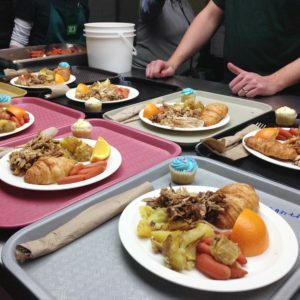 Though St. Felix Centre had budgeted to feed 100 people per night during the dinner program, the number of people fed often exceeded 200, exhausting their resources and staff. 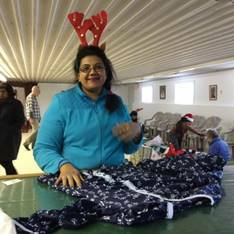 In the winter of 2016, Amma Canada supported St. Felix’s ECWA program by providing volunteers for the meal program. 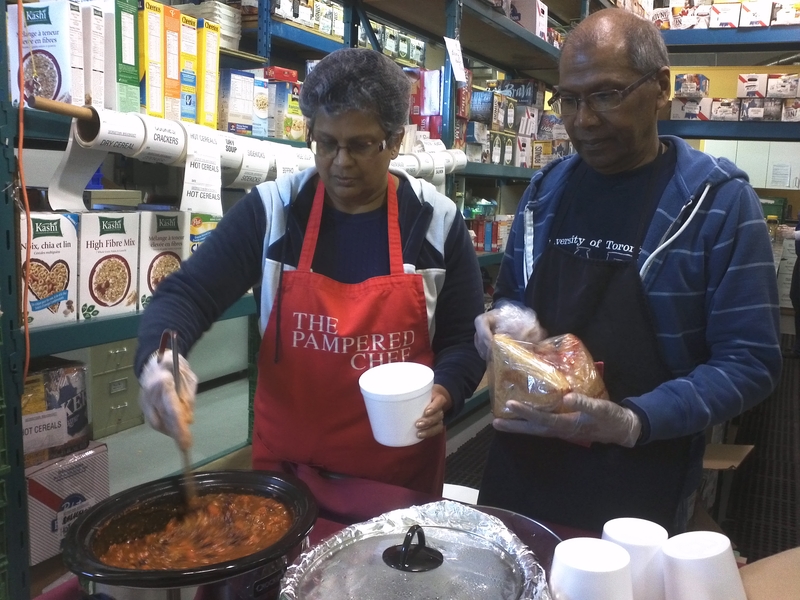 In total, twelve Amma Canada volunteers participated in the lunch and dinner programs, preparing and plating food, serving coffee and tea, clearing tables, washing and drying dishes, and cleaning the kitchen. 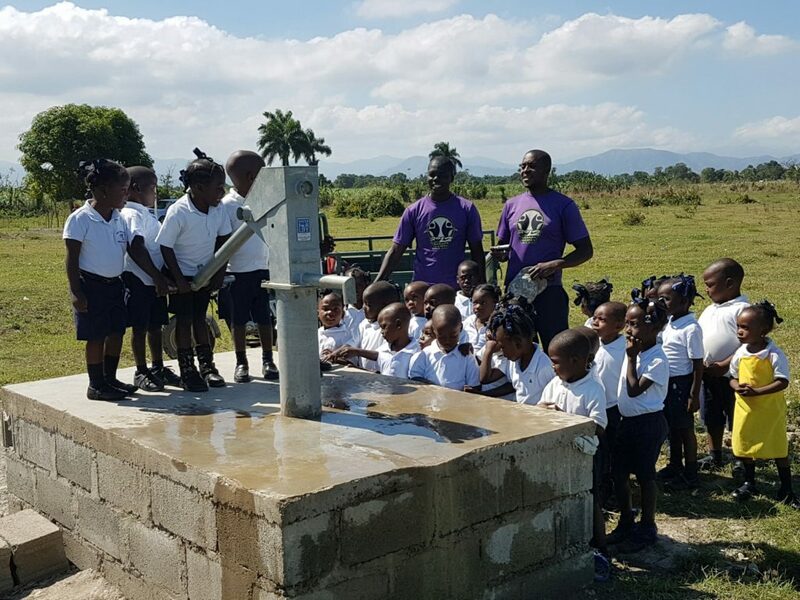 The volunteers generally worked on different shifts, according to their schedules, and integrated with the team of St. Felix staff and volunteers working that shift. 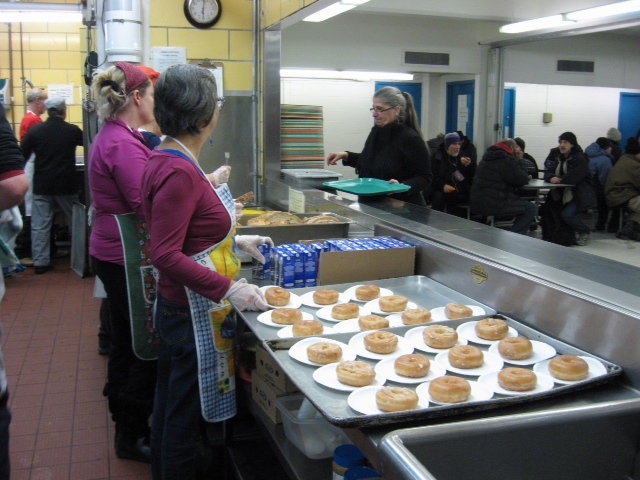 In early January, some of the Amma Canada volunteers working in the ECWA meal program reported that food served was insufficient to satisfy the hunger of the participants. Amma Canada responded by donating $500/week to St. Felix Centre for the purchase of additional foodstuffs to supplement the meals for the duration of the ECWA program. These funds were used to “obtain fresh and high quality [food] items in bulk quantities. Amma Canada further supported the ECWA program by donating much needed goods that would otherwise have gone to waste. 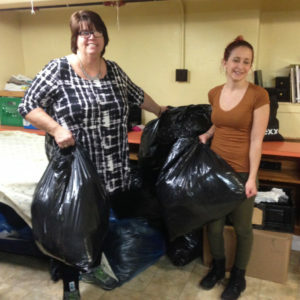 Amma Canada ran a winter clothing drive at their Georgetown centre, and donated fifteen large bags of men’s used clothing and footwear, and toiletries of all kinds to St. Felix’s Clothing Bank. The donated items were distributed among the needy people who were happy to receive them. . Finally, Amma Canada collected from the Georgetown Bread Basket ten cases of non-perishable food items that were approaching their expiry date and donated them to St. Felix’s kitchen, where they were quickly used in a day or two. 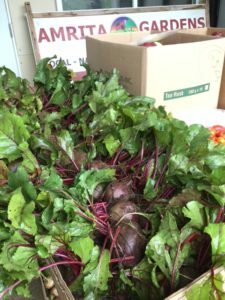 With this action, Amma Canada was able to both help feed the hungry and prevent food waste. On the whole, Amma Canada’s involvement in St. Felix Centre’s ECWA program has been a great success and has undoubtedly helped many people living on the streets of downtown Toronto in winter. For the winter of 2017-2018, Amma Canada donated $6000 to St.Felix Centre for the Extreme Cold Weather Alert program and $9000 for the winter of 2018-2019. The ECWA program has been renamed the WRS (Winter Respite Services) program. Amma Canada’s volunteers look forward to continuing their participation in the projects run by St.Felix Centre to serve the homeless in downtown Toronto. Once a month, from March 2007 onwards, around ten volunteers from the Montreal area have been supplying the groceries and preparing lunch for close to two hundred homeless people, at a registered charity known as Mission Bon Accueil, or Welcome Hall Mission. Also, during the Christmas season, the volunteers donate toys, socks and clothing to the children who are clients of the Mission Bon Accueil. 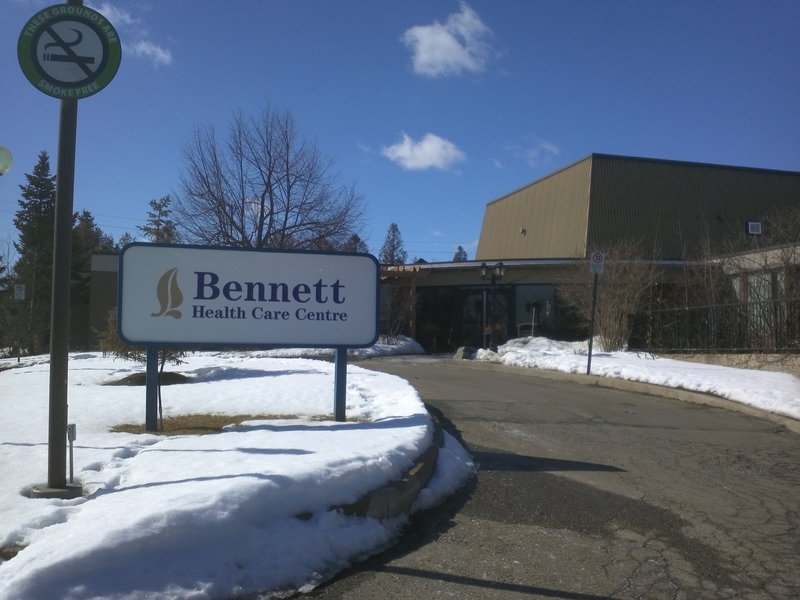 From mid-2014, a small group of dedicated volunteers has been visiting residents at the Bennett Health Care Centre, a registered, non-profit long term care facility for 68 residents, on Saturdays and when available, during some weekdays. 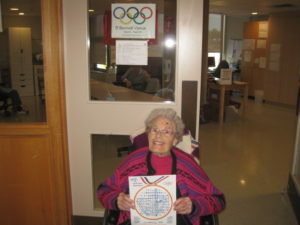 They assist with friendly visiting, arts and crafts, bingo, running the snack/book cart and feeding of the residents. 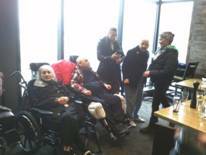 In February 2015, ten residents in wheelchairs were taken on an outing to Ripley’s Aquarium in downtown Toronto. 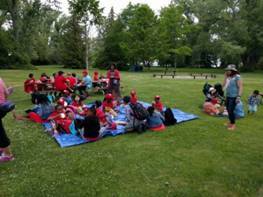 The picnic was so enjoyable to the residents, the staff and volunteers from Bennett and Amma Canada that it was decided to do another picnic in 2016. 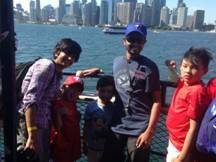 On February 29th, 2016 Amma Canada volunteers accompanied nine Bennett Health Care Centre residents in wheelchairs, along with their volunteers and staff (Georgetown) on the highly anticipated trip to Niagara Falls.Sponsored by Amma Canada, this year’s outing consisted of lunch at one of the restaurants overlooking the falls followed by a bus tour of the falls . Although the day was cloudy, windy and very cold, it did not dampen the spirits of those present. 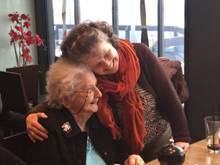 Laughter, conversation and good cheer filled the dining area as we sat and ate together. Amma Canada is pleased to sponsor a 40 hour music therapy program, to enrich the lives of the residents at this long term care centre. An accredited music therapist will work with all the residents, both in small groups and with individuals, using piano, guitar, small percussion and chimes. The benefits of music therapy include improved memory recall and social interactions; help to alleviate depression and aid with stress management. 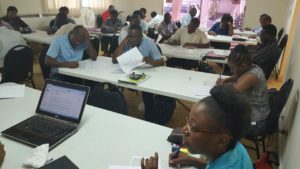 The sessions started in September 2016 and have continued through 2017 and 2018 and have been extended for another year, till the end of 2019. 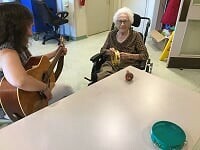 Thanks to the generosity of Amma Canada, the Bennett Centre Long-term Care was able to continue the music therapy program for an additional 16 weeks until the end of the year. Kristen Anderson, a Registered Psychotherapist (RP) with Music Therapist Accreditation (MTA) is on-site for group and individual sessions for 5 hours every other week. 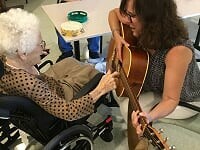 Music therapy was offered to 30+ residents on session days made up of large groups, smaller dyads and individual sessions. Residents were referred to the program by recreation and nursing staff for various goals including: Meaningful Social Interaction, Emotional Support Coping with Change/Loss, Cognitive Stimulation/Memory Care, End-of-Life Care and Enhanced Quality of Life. It is estimated that music therapy in some form is being accessed by 75% of the residents at Bennett. Interventions included instrumental improvisation (maracas, buffalo drum, and ocean drum), singing familiar songs, live music facilitated reminiscence, memory care (orientation to time/place) and relaxation. Group music therapy sessions were offered to two male residents who together had a tendency to walk the halls and exit-seek. 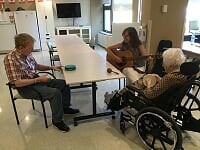 In recent music therapy sessions, they chose to stay in session for the full 60 minutes, and though sessions are near the entrance to the facility, neither resident chose to leave the session to go outside. Later in the day, one of the residents made reference to the morning session and how much he enjoyed it. For a resident who engages in individual music therapy sessions and lives with vision loss, the therapist has downloaded the audiobook of the resident’s favourite artist, as read by the artist himself. The book will be put on the facility’s iPad for the resident to enjoy as an independent activity. 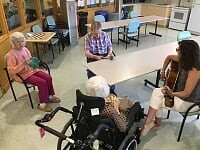 In recent group music therapy sessions, residents who have previously chosen not to participate in activities are now strumming the guitar, playing instruments, singing and engaging in discussion. Strumming the guitar encourages residents to entrain to the music and focus on staying in rhythm. Cognitive stimulation occurs when they sing while performing the actions. Residents who were less responsive before seemed to ‘come out of their shell’ and were smiling and laughing after strumming the guitar. Again, in a recent individual music therapy session, the music was used to orient the resident to time and place as she was upset and wanting to ‘go home’. The resident initiated conversation about her own health situation and was able to identify her own dementia and share the experience of living with the disease. 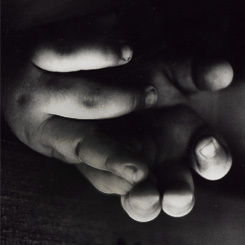 Music allowed the resident to express the fear and sadness and be heard. In music therapy, residents have the opportunity to exercise control over their environments that they may not experience in day-to-day activities. This occurs through song choices, instrument choices and even choosing whether to engage in music therapy. Eight weeks of the 16 week program have been completed to date and will continue to the end of the year. Large group sessions will continue on each of the session days together with smaller groups and individual sessions where appropriate. Priority is always given to those under palliative care and they are top priority on the music therapist’s caseload. Amma Canada sponsors Olympic event for Residents. 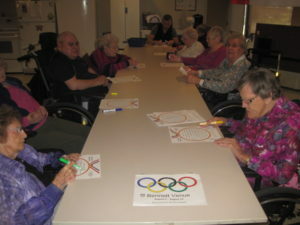 Over a two week period in August, a series of participative games, ring toss, word games and crafts were organized for the residents to coincide with the Rio Olympics. 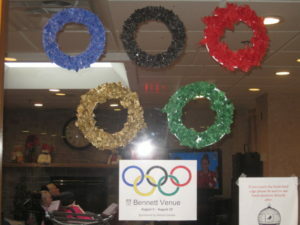 This was a fun event, concluding with prizes and Olympic cakes for the winners and all the residents who participated! 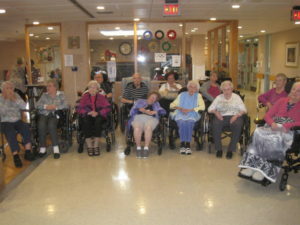 Outing for residents of Bennett Health Care Centre. 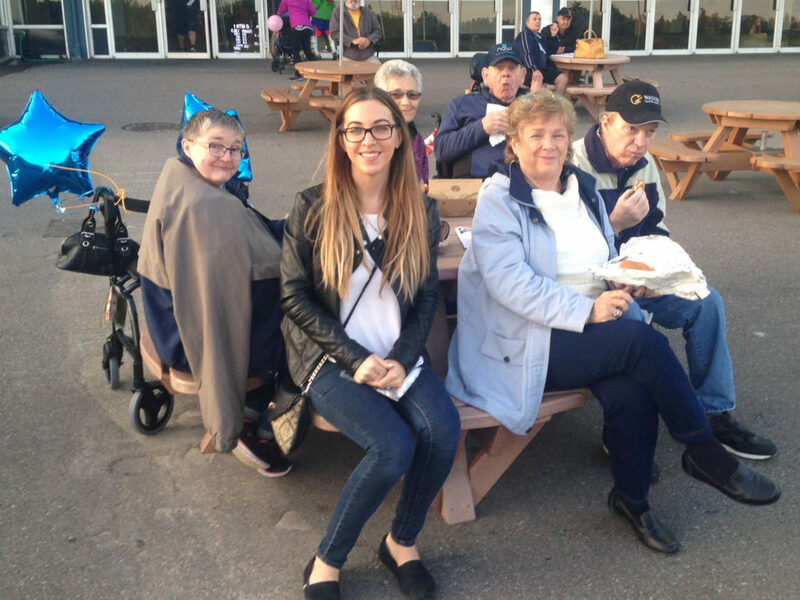 On Thursday, August 31, (2017), Amma Canada sponsored an outing for twelve seniors from Bennett Health Care Centre, four staff, and four family members to the Mohawk Racetrack, in nearby Milton. 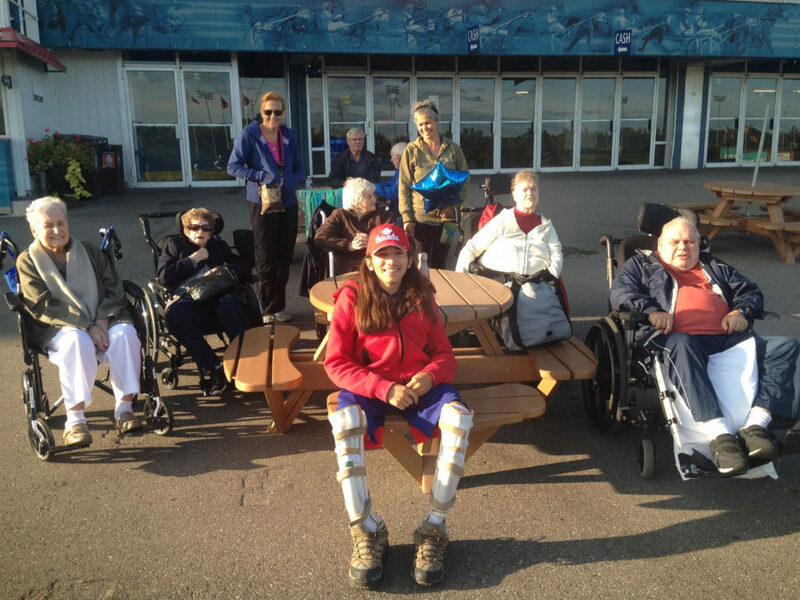 Four Amma Canada volunteers joined the excursion and assisted those seniors with wheelchairs or walkers. 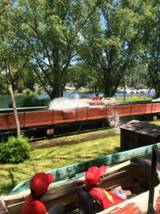 Bennett Centre residents had voted Mohawk the number one destination they wished to visit, and this was their only sponsored outing this year. 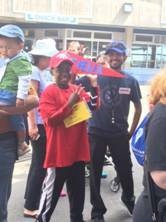 Amma Canada was pleased to provide transportation, meals, and snacks for all participants, including loot bags for each resident. 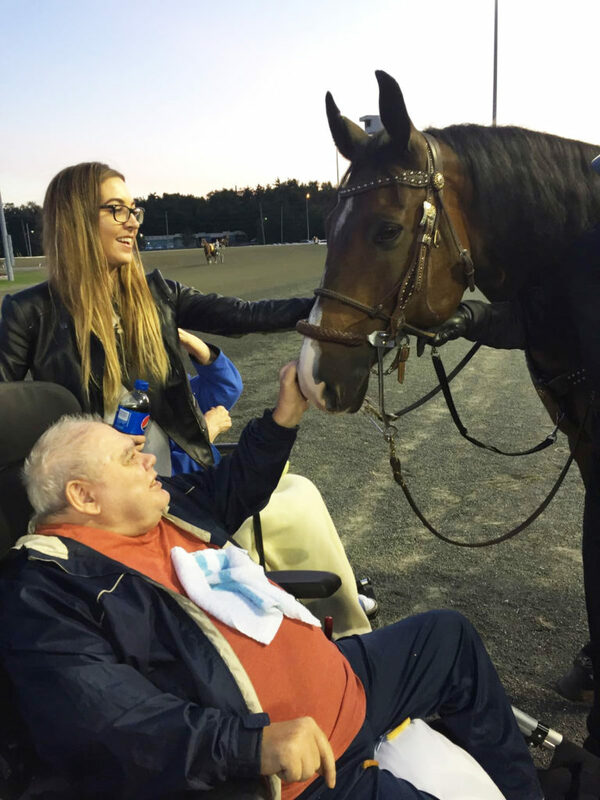 The seniors enjoyed the pleasant evening outside at dusk, watching the horses warm up on the track while savouring Tim Horton’s coffee and tea. 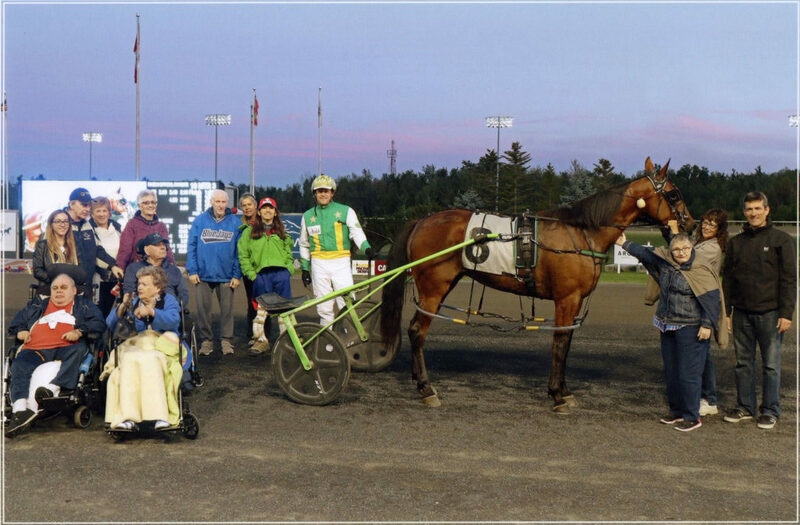 Highlights of the evening included when a group photo was taken with the horse Firestorm in the Winners Circle, and when another track horse came to visit the group. The residents were thrilled at the experience of petting him. 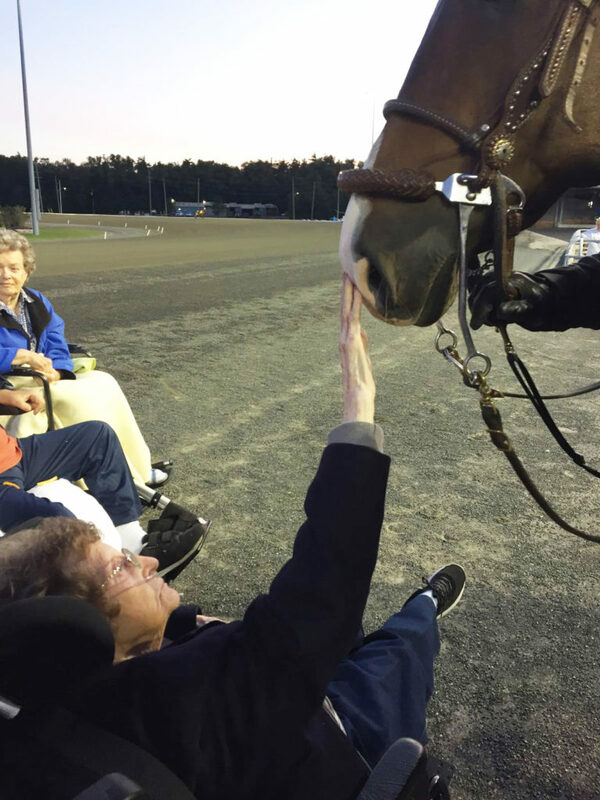 It was very touching to witness the seniors’ smiling faces and heartfelt laughter as they interacted with the horses. As they were escorted back to the vans, one senior was overheard saying “This was the best evening I have had in years! Thank you.” Amma Canada volunteers felt blessed to participate with the seniors. 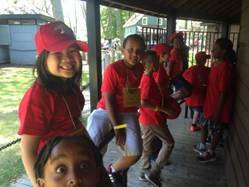 They expressed gratitude to Cindy McCoy, Bennett Centre’s Recreation Coordinator, and her staff for organizing such a special outing. Fondation QHASUQ (Quebec-Haiti pour une Scolarisation Universelle de Quebec) is a registered Canadian charitable organization, working with GRAHN, an entity set up to address the rebuilding efforts of Haiti, after a powerful earthquake, measuring 7.00 on the Richter scale, struck Haiti in January 2010 resulting in the death of more than 230,000 people and extensive destruction estimated at billions of dollars. 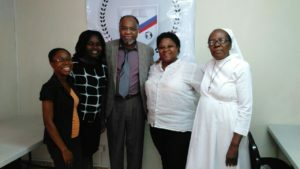 In January 2015 Amma Canada signed an agreement with Fondation QHASUQ to provide six bursaries per year to deserving women enrolled in computer engineering and similar programs at ISTEAH, the Institute of Science, Technology and Advanced Studies of Haiti. Each bursary is worth $2000 US per year and the agreement is effective for five years.. The first batch of women students, for the academic year 2015-2016, was selected by Fondation QHASUQ on the basis of their academic and extra-curricular records. 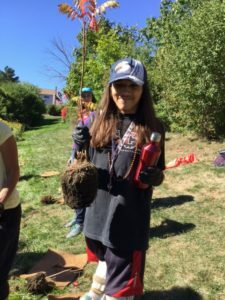 These students are enrolled in a three-year program and they would continue to receive the Amma Canada bursary each year for the duration of their studies at ISTEAH. 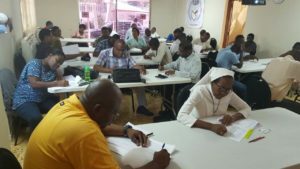 Attached are a few pictures showing ISTEAH, a classroom where an exam is in progress and four of the six bursary recipients with one of the Directors of QHASUQ, who is a professor at École Polytechnique de Montreal. 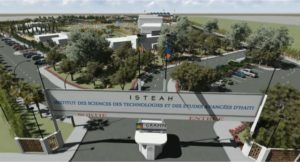 In early 2017, ISTEAH started construction of a new campus in the rural area near Milot in north Haiti. In the process, ISTEAH has hired and trained many local women for some of the administrative positions. 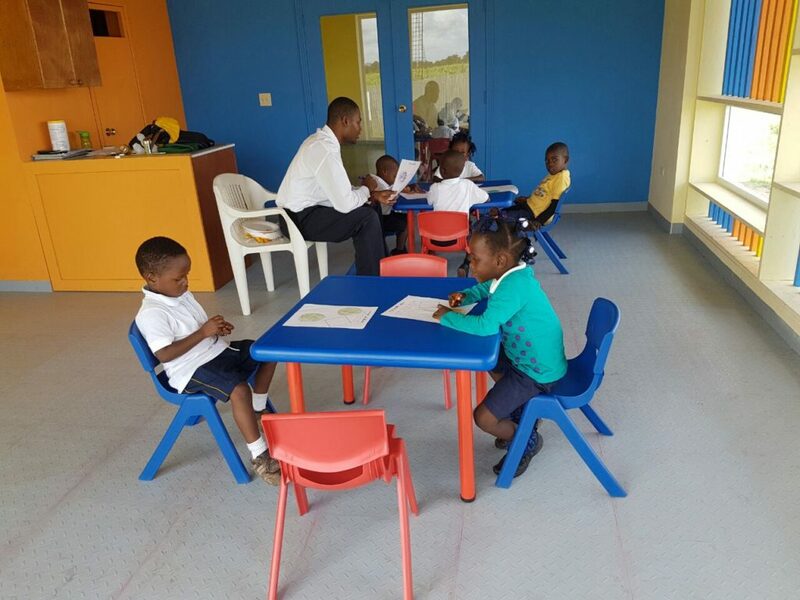 A daycare has been started on the site to look after the children, and prepare them for the future. 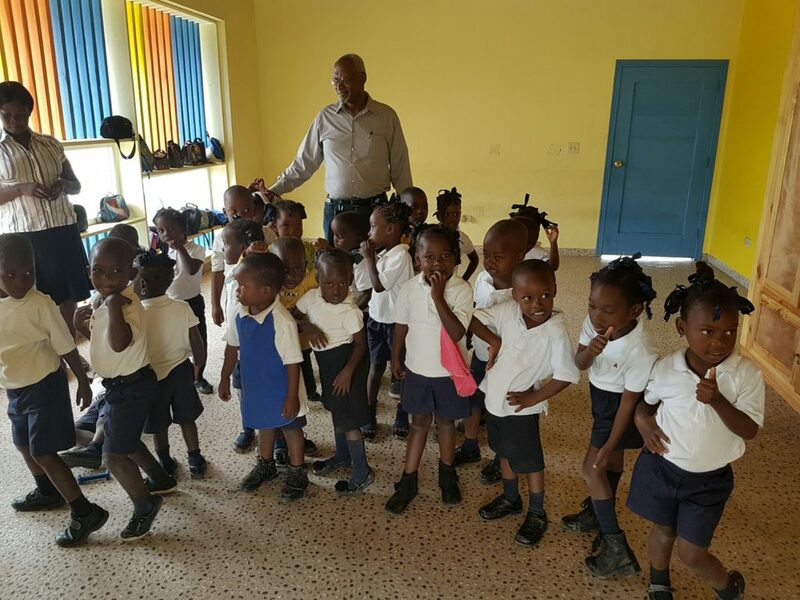 Since the children are from economically challenged families, ISTEAH needs sponsors for the children in the daycare. It costs US$600 per year for one child. 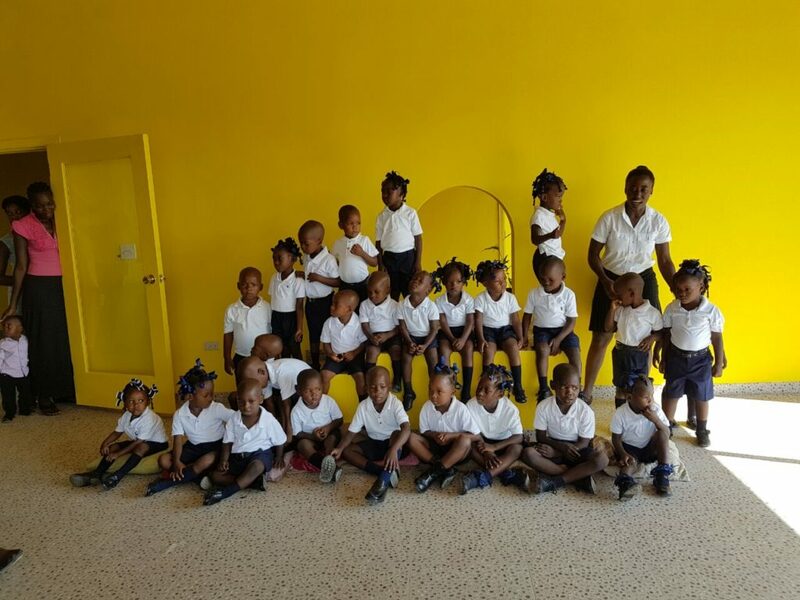 Amma Canada is sponsoring ten children at the daycare. The sponsorship is to go on for five years starting September 2017. 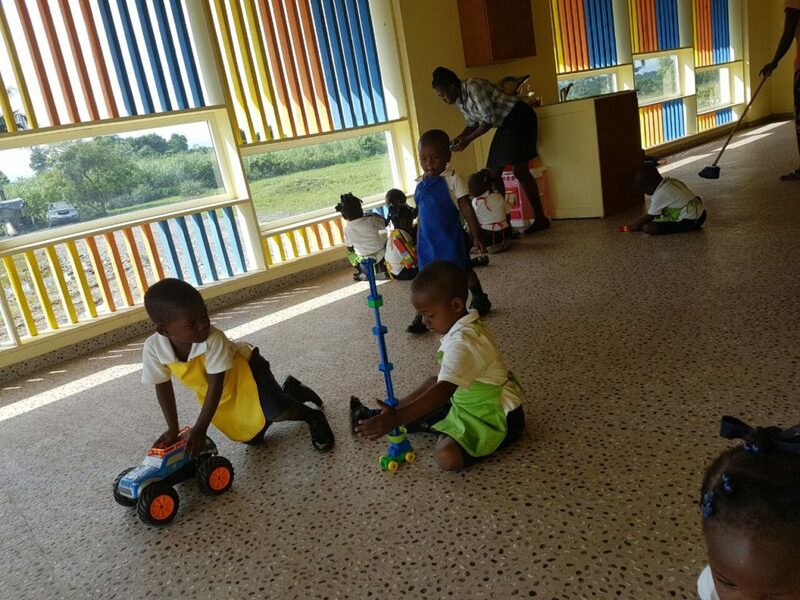 Attached are some pictures of the children at the daycare. 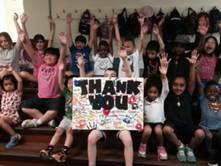 Each year, starting in 2012, Amma Canada has been supporting the Peel Children’s Aid Foundation (PCAF) by awarding bursaries to deserving youth who have been wards of the PCAF. The bursaries enable the recipients to pursue courses at a university or community college. Each year, two or three bursaries have been awarded, the recipients being selected by the PCAF on the basis of their academic record and motivation – the value of each bursary is $2500. Each year, starting in 2004, Amma Canada has been donating Christmas baskets to needy families, through registered charities. The baskets are filled with gifts selected from wish lists prepared by the members of the families themselves. 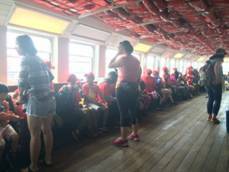 In some cases, the families are treated to a special dinner or to gift cards as deemed appropriate by the responsible charity staff. The write-up which follows is from Christmas 2016 but is similar to gifts for other years. Here is a brief report (in their own words) from the provinces of British Columbia, Quebec, and Ontario showing how the volunteers in those regions participated in the process of bringing some Christmas cheer to families in need. On December 17th, volunteers gathered at the Toronto Centre to decorate the Christmas tree and participate in the spirit of giving, by wrapping 22 individual holiday gift bags for 10 sponsored families with the agency Links2Care. Volunteers were each assigned a family and purchased requested items, including pyjamas, socks, underwear, toiletries, and small gifts for each of the children, ranging in ages from 4 months to 16 years. Gifts and tins of cookies were carefully assembled into 22 colourful felt Santa bags and delivered on Monday December 19th to the Georgetown office. 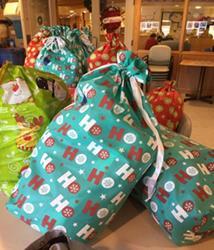 The Director and staff were thrilled to receive the bags and eager to distribute to the families for Christmas. 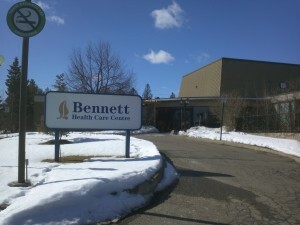 Amma Canada sponsored 16 residents of the long term care facility Bennett Centre, who had no visitors over the Holiday season. 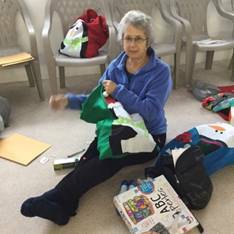 Volunteers thoughtfully assembled Santa bags, each containing a Sherpa blanket, Walmart gift cards, colourful scarves, books, slippers and other requested items on their Angel Wish list. As a special gesture, a group of children crafted handmade Christmas cards, which were distributed to the delight of the residents. Amma Canada volunteers also delivered a donation of toys to the Georgetown Salvation Army Toy Bank. In a new initiative this year, Amma Canada partnered with both Georgetown Bread Basket and Acton Foodshare, to reach out to assist families in need in the Halton community over the Christmas season. A total of 250 food/gift cards were distributed to families and individuals in the amount of $20 for a choice of 5 grocery chains in the community. Response from the staff and recipients has been very positive.“Thanks again for your support and for partnering with us on the gift cards. 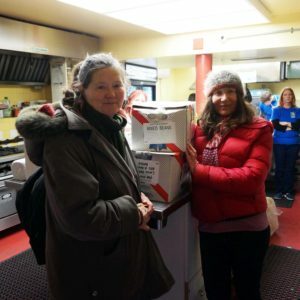 This generous and kind gesture had a profound impact on our families.” (Chair, GBB) In addition, jars of Amma Canada honey, were offered to the recipients at the soup kitchen on December 14th at Georgetown Bread Basket. 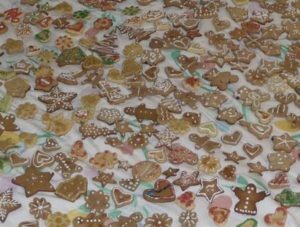 Devotees prepared 165 dozens of cookies baked by 13 volunteers and distributed 329 sachets to 3 organizations (NPO). The sachets (except those for Dans la Rue) were beautifully decorated with handmade Christmas cards created by 10 other volunteers. Dans la Rue: NPO for Homeless Youths: 150 sachets + 18 for their volunteers. La Maison d’Hérelle: NPO supporting individual suffering from AIDS/HIV in the community: 18 sachets and 18 for their volunteers. Each year, ‘Presents of Peace’ is organized through the YWCA to provide families in need with funds for food at Christmas time, as well as gifts from the wish-lists of each family member. 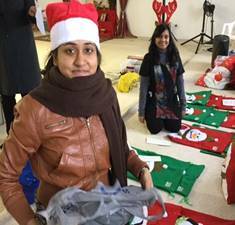 Volunteers from Vancouver (with sponsorship from Amma Canada) are able to shop for, wrap up, and deliver presents to a number of families each year through this program. 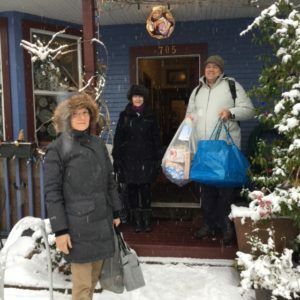 This year, we were able to shop for 4 large families….The falling snow reminded us of Amma’s flowers of peace falling to the Earth…..
For all of us, it is a great way to start the holiday season, sharing Amma’s compassion and joy even in such a small way. In Victoria, a volunteer made homemade chocolates and they were distributed to the homeless by our “Amma’s Kitchen” crew. The chocolates were well received ! 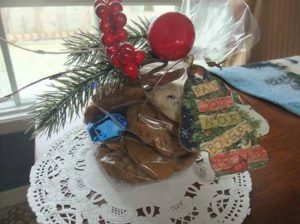 In past years we have done many baskets with toques, scarves, gloves and sweets. about our current and upcoming events.